In the by now traditional Christmas – Splash bottles No. 72, No. 82, and No. 85 were put into the river Ems in Telgte. All bottles are small world bottles, No. 72 the first I made, featuring the smalles book on a bed. Bottles No. 85 has the largest book, in the form of an art folder. And No. 82 is one with apples in a basket. 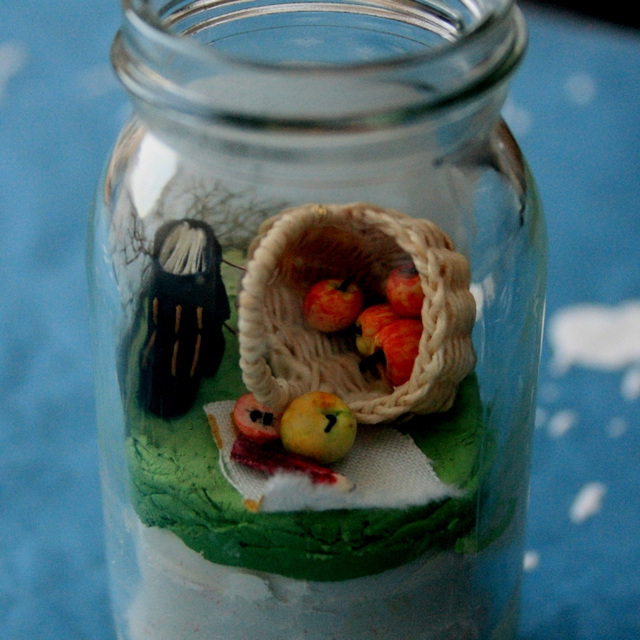 Originally I thought, I’d do something special with the small world bottles, maybe exhibit them before throwing them in. However, it feels like I have hung on to them for too long already, and so I am planning to put in all of the bottles I currently have. So hopefully tomorrow I’ll put in the last three bottles I still have. – Then it’ll be time for new bottles! 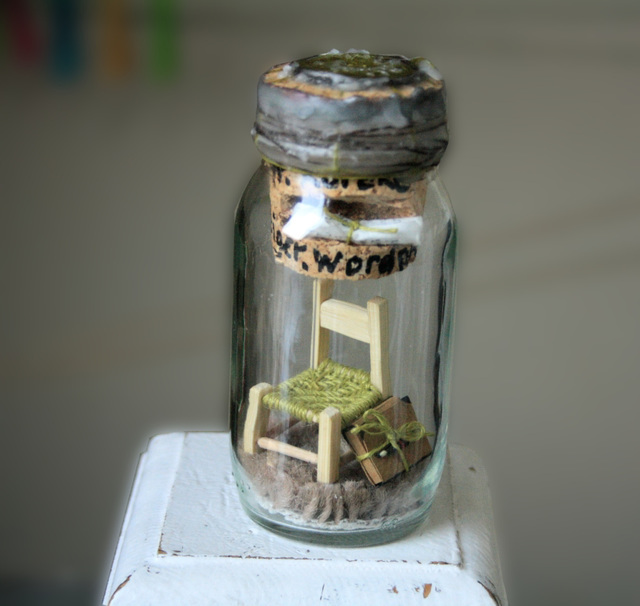 Small Worlds – The Chair. 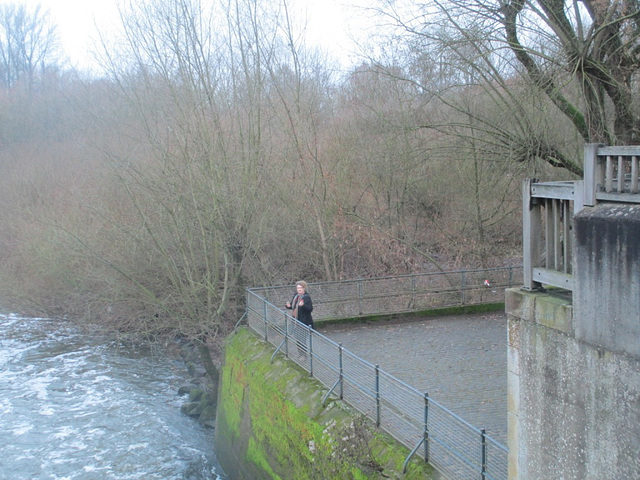 Like the past two years I spent the Christmas Holidays in Germany, visiting family. 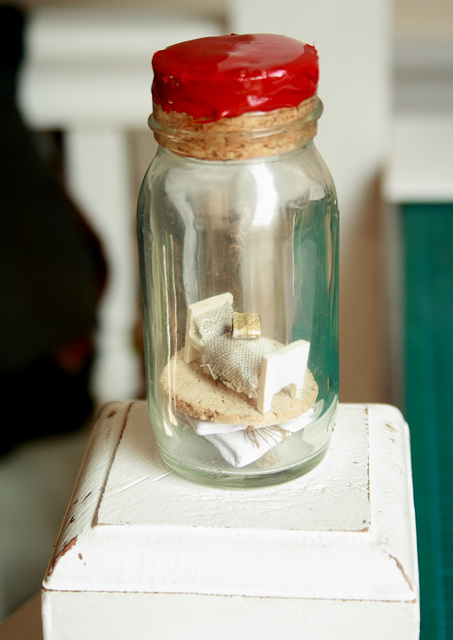 And, just like the past years, I brought messages in bottles with me. The first bottle, No. 73, was tossed into a black North Sea in the small hours in the morning from board the Pride of Rotterdam, about an hour before we reached the harbour in Rotterdam. Wie auch die letzten beiden Jahre habe ich die Weihnachtsferien in Deutschland verbracht. Und, ebenfalls wie in den letzten Jahren auch, habe ich die Gelegenheit genutzt, ein paar Flaschen abzuwerfen. Die erste Flasche trägt die Nummer 73 und den Titel “die Biene”. Ich habe sie in den Morgenstunden vom so genannten Sonnendeck der “Pride of Rotterdam” geworfen, etwa eine Stunde bevor wir in den Hafen in Rotterdam eingelaufen sind. 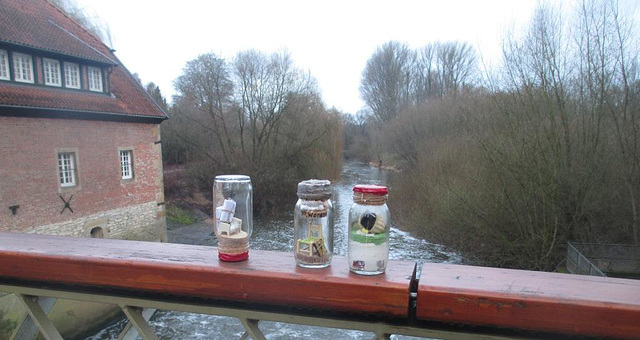 The second bottle was dispatched in to the River Ems in Telgte the day before Christmas Eve. The Ems splits into a main and a side arm in Telgte and both rejoin just a little North of the city center, behind the monumental church (well, monumental, given the size of the city). The main arm is slowed down with a weir there, which is where I threw last year’s bottle in. This year we went 10m further down the road and my son put bottle No. 76 “the star” into the smaller side arm there. Die zweite Flasche, Nummer 76, habe ich am 23. Dezember in Telgte in die Ems geworfen. Naja, eigentlich nicht ich selbst, sondern mein Sohn. Er steht hier und schaut flussaufwärts, seine Schwester schaut in die andere Richtung und hält Ausschau nach der Post. Bis er und ich auf der anderen Brückenseite ware (eigentlich nicht weit), und ich die Kamera für ein letztes Foto bereit hatte, war die Flasche schon davon geschwommen. – Die Ems war recht voll und erstaunlich schnell an dem Tag. Below you can see how the river looks like there. The water was high and quick, and when I had turned down and tried to make a picture of the floating bottle, I had already lost sight. Maybe one of you can spot it in the photo? I definitely can’t not even when looking at it in full resolution. In Telgte teilt sich die Ems und fließt gerade durch die Stadt als ein Haupt- und ein Nebenarm, die sich kurz unterhalb des letzten Wehrs in Telgte wieder vereinen. Letztes Jahr habe ich in den Hauptarm geworfen, diesmal haben wir uns für den Seitenarm entschieden.Man kann die Stelle auf dem Foto oben beinahe erahnen. – Aber wahrscheinlich nur, wenn man den Fluss da kennt.Ich wünsche beiden Flaschen glückliche Finder! I hope both bottles will meet kind and happy finders!